Hello and welcome! 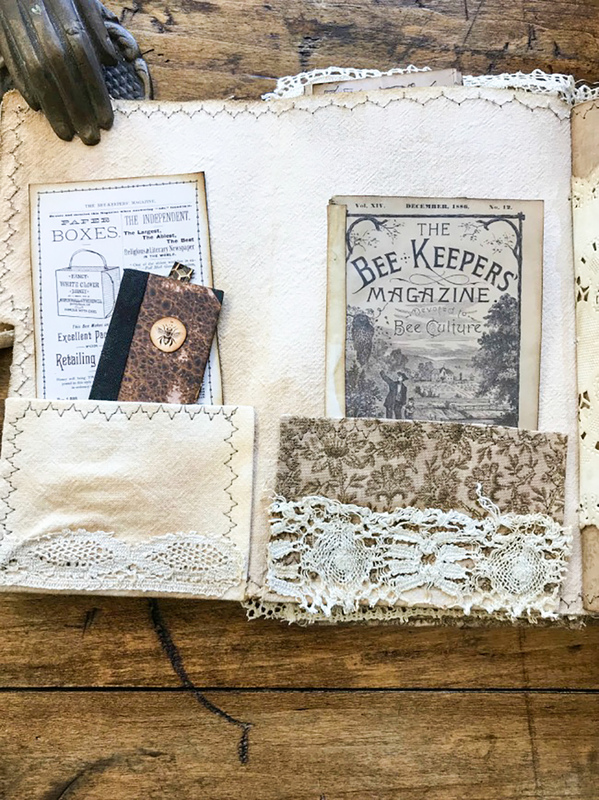 I’m Cheryl from A Penchant for the Past, and I’m excited to bring you The Beekeeper’s Journal. 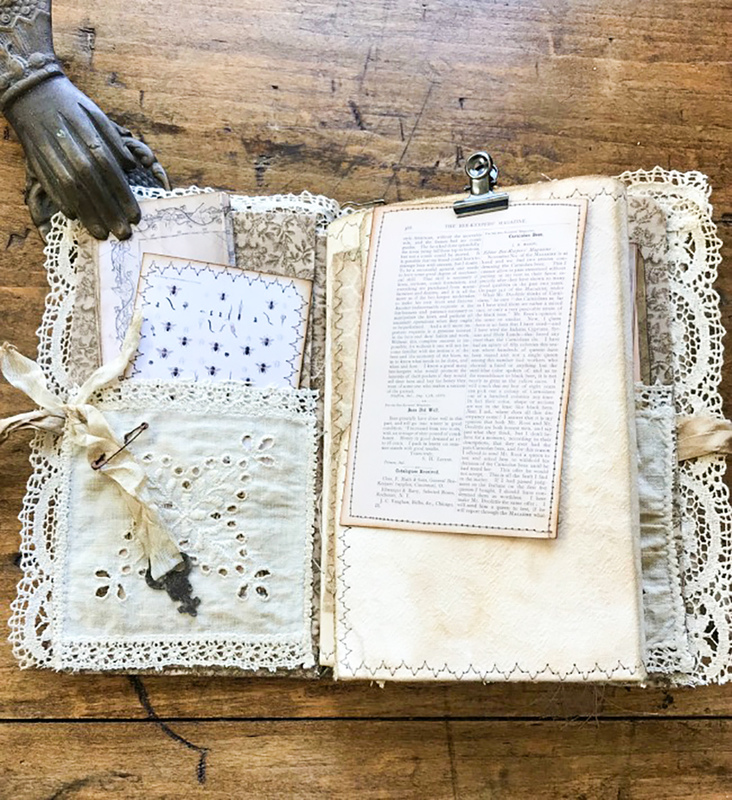 My goal for this project was to create a journal that was different from past journals I’ve made, so I’ve merged my newest love the altered file folder with a junk journal. I hoped I’ve sparked your curiosity to come check it out. Let’s begin by taking a look at how I constructed the journal cover. 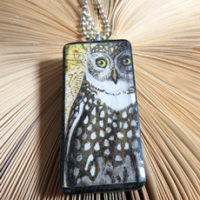 For the cover I used a vintage Reader’s Digest book. Since the book was larger than I wanted I cut it down with a heavy duty paper cutter. After rounding the edges I covered it with a printed cotton fabric that coordinates well with the graphic prints I’ve created. 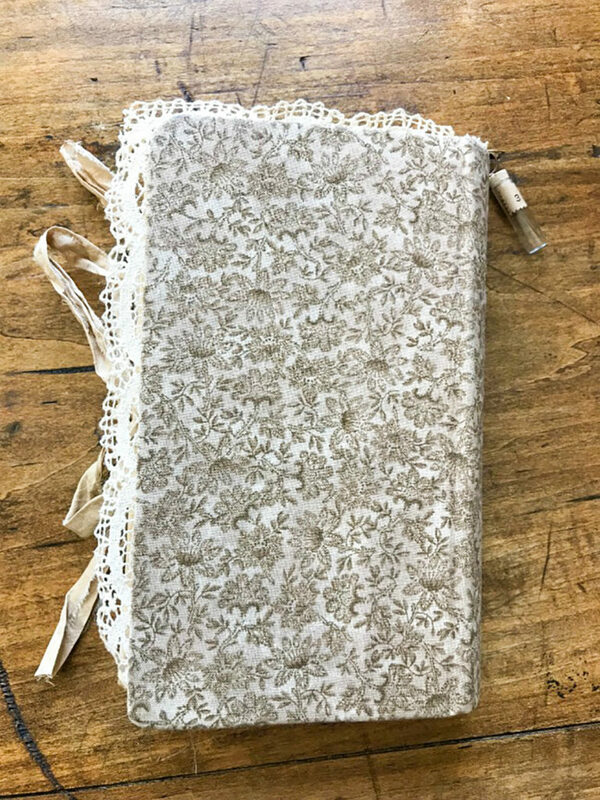 Then, I, added some lace to the front and back covers to soften the look of the journal. 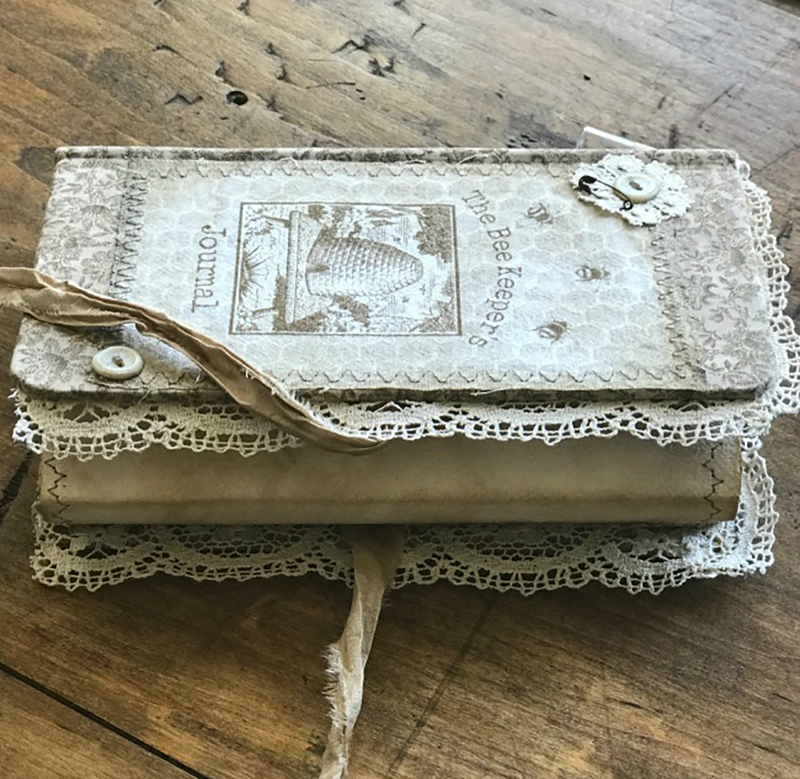 I intentionally didn’t add any lace to the bottom of the cover because I thought, if the journal was stored upright, it would possibly get in the way. 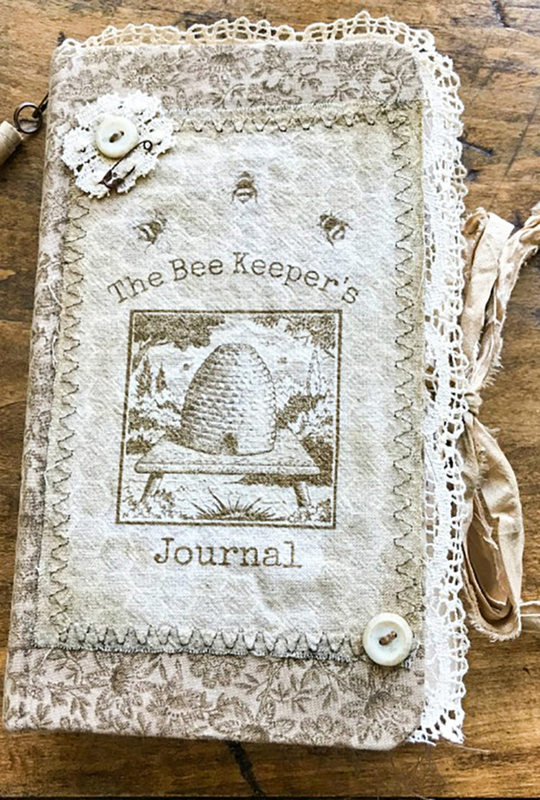 I was able to create the fabric graphic prints on the front cover and on the inside from the Beekeeping bundle found on The Graphics Fairy’s Premium Membership Site. To do this I used individual .png files of the bee, honeycomb, and the bee skep as overlays on the page and then added the title text to it. I also, changed the color of each of the images because I wanted more of a brown color. If you aren’t familiar with how to use overlays to create your own graphic designs the Premium Membership site has a library of Photoshop Elements tutorials that will aid in the process. I felt these graphic prints needed to be printed out on coffee stained fabric and not paper, so I used the freezer paper method to print these images onto fabric using an inkjet printer. I’ve sewn around the images with a contrasting color and then slightly inked the edges. 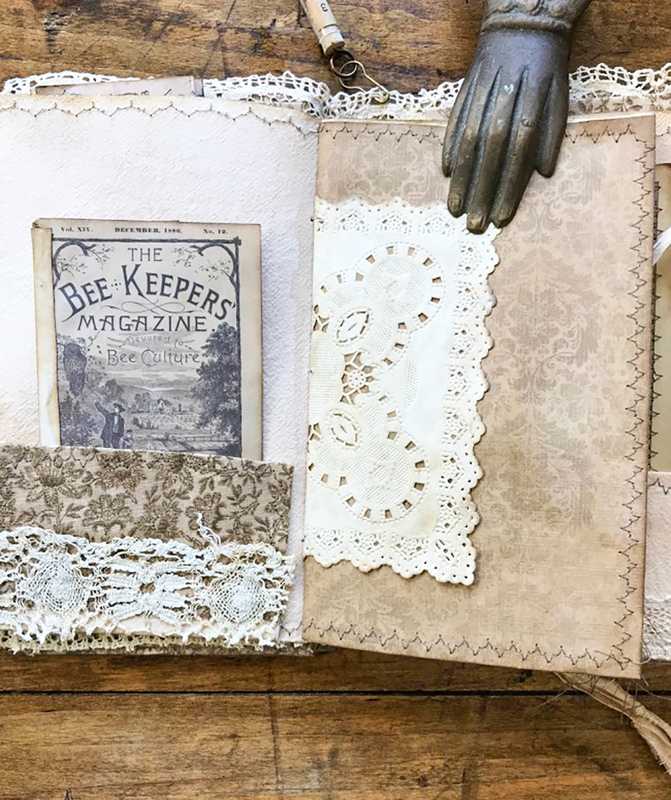 I further embellished the cover by adding a vintage lace flower with an antique button center to one of the corners and to balance it out I added another antique button to the other corner. I, of course, have a thing for rusty safety pins, so I had to add one of those to the cover as well. At the spine, I’ve added some vintage lace. Since there’s loops in the lace I thought it was a great place to hang one of my vintage watchmaker’s vials. These tiny vials are a great place to store a little note or secret. I left the back unembellished since the front cover is a bit busy. As you can see in the side view of the journal the altered file folder does fold up nicely upon itself concealing the contents within. I added sari silk ribbons to the front and back covers to form a tie closure, which helps keep the journal securely together. Inside the front and back covers I used more of the same fabric that’s on the cover along with some vintage lace pockets for additional storage space. Inside the front pocket you can see I tucked away some other great finds that I got off The Graphics Fairy Premium Membership site. One is a U.S. and Mexican Territories Map, which I’ve aged with ink and chalk paint wax. The antique bee print I resized to fit the journal and I antiqued it with ink and have backed it onto coffee stained paper. 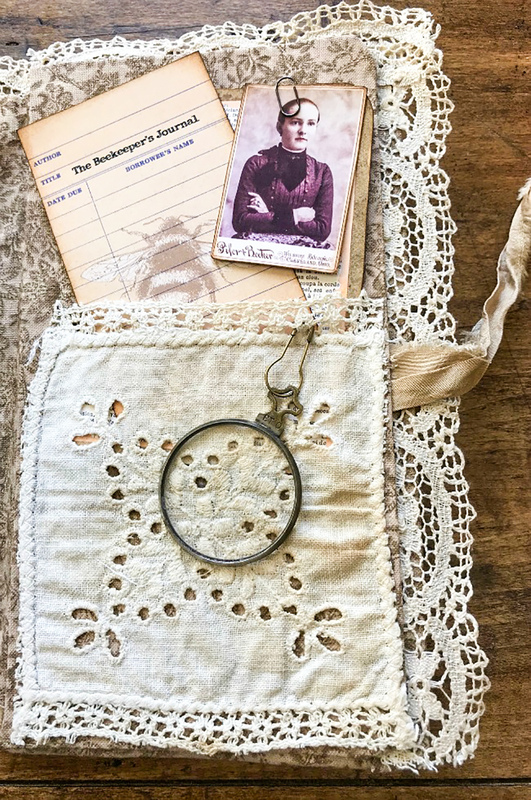 The back cover’s pocket is holding an antique young lady’s photo, a printable journaling card backed with antique ledger paper, and a library card that I’ve created from combining individual graphics. For the altered file folder portion of the journal, I used a regular size manila file folder that I’ve folded into sections. When doing so I made sure that when it was all folded up it would fit perfectly inside the journal cover. I used coffee stained fabric to cover the folder and I’ve sewn around the outside edge with a decorative stitch. 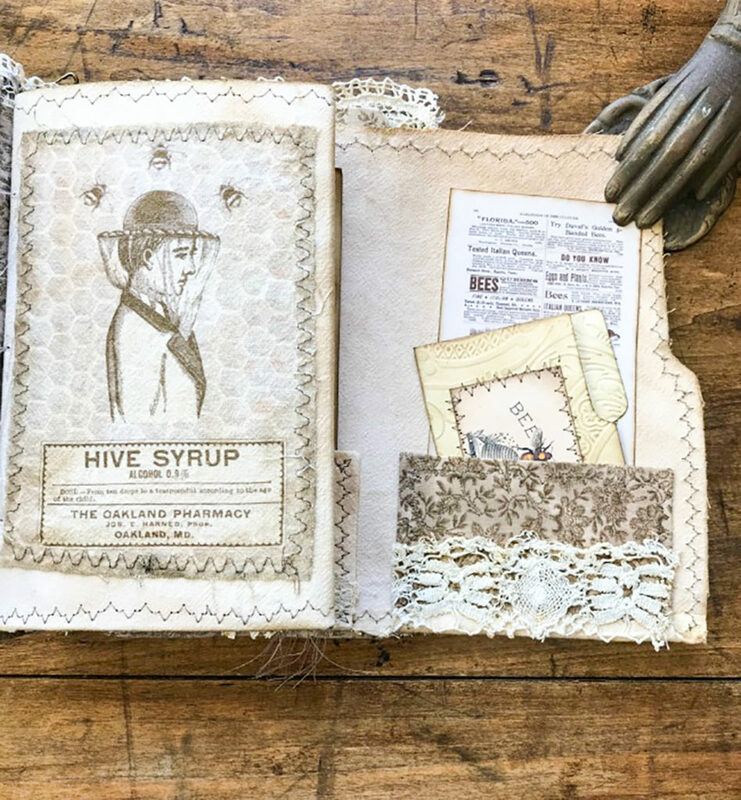 The fabric graphic print on the folder is similar to the front cover, but this time I added a beekeeper image and a pharmaceutical ad to the honeycomb background. 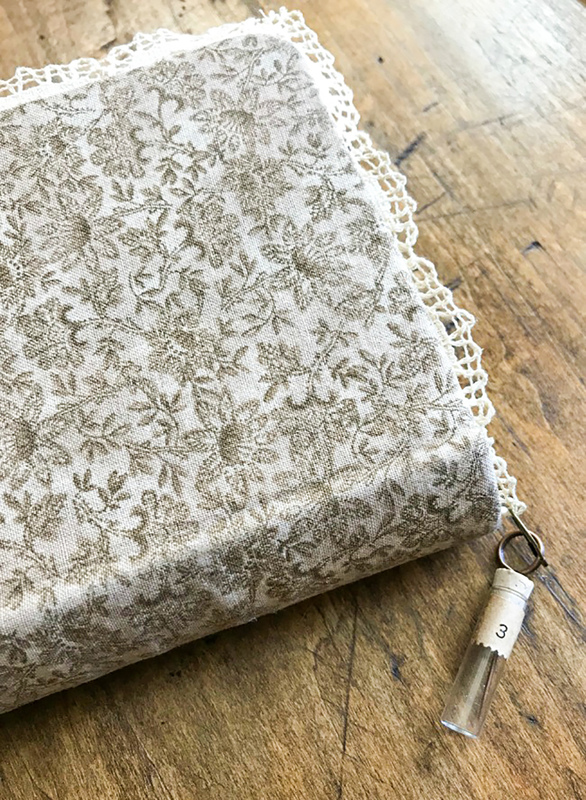 I gave each of the file folder sections a small pocket embellished with some coordinating fabric and vintage/antique lace. Since this type of journal could only hold one signature I’ve created two smaller junk journal style notebooks that fit nicely into one of the four pockets. The notebook covers I’ve used antique beekeeping magazines covers from the late 1800’s, which I reduced in size before printing. I envision a beekeeper taking one of these little notebooks out to their hives to take some notes, or perhaps maybe to use as a care log. Like a typical junk journal, I’ve added a combination of papers such as coffee stained, blank music, aged tracing, antique ledger, aged doily, scrapbook, and vintage book pages. 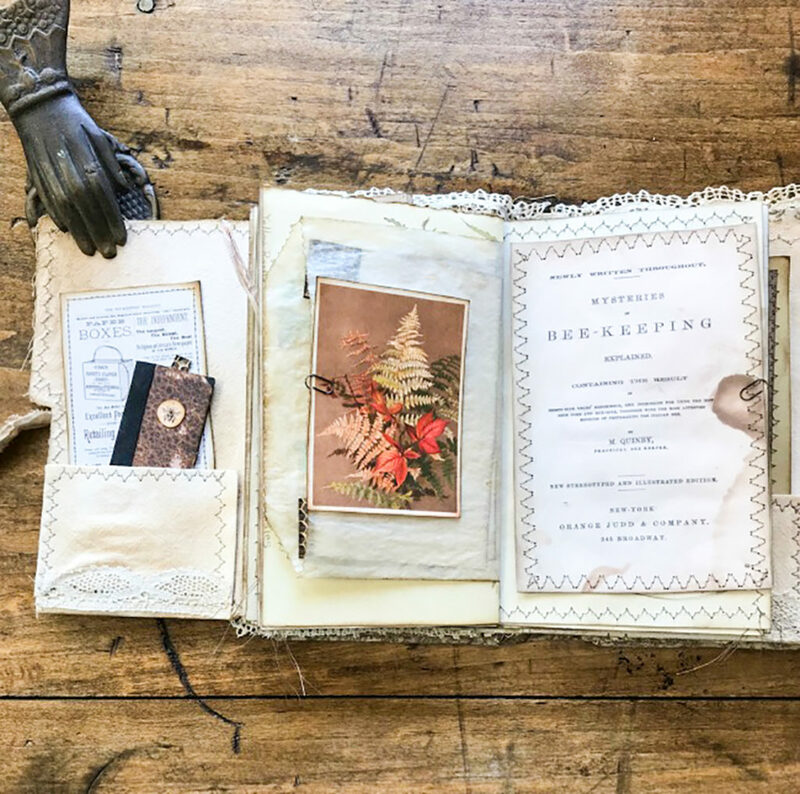 I’ve also added some wonderful reproduction antique prints and bee-related ephemera from the Premium Membership site, which I’ve printed out on coffee stained paper. 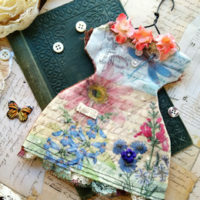 Some have been sewn and others were left as is to look as though they were torn from a beekeepers’ magazine and stowed away in the journal. 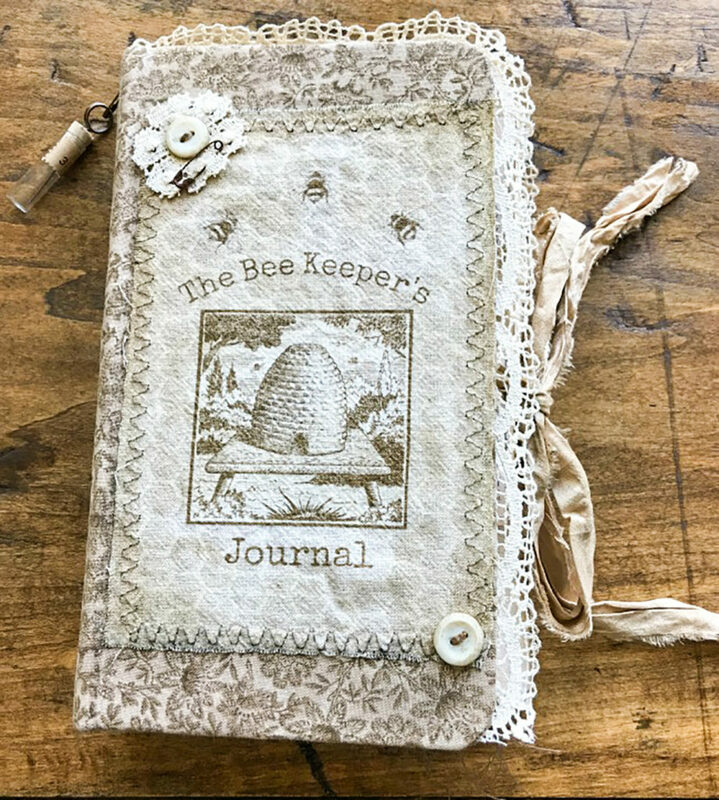 I could continue to write more, but I think a better option is for you to go view my flip through video for a more in-depth look at The Beekeeper’s Junk Journal. I do hope this inspires you to try something new the next time you create a journal. Please go check out The Graphics Fairy’s Premium Membership site if you haven’t already you won’t be disappointed. I also, want to thank you for taking time out of your day to look at my latest Design Team project. I will be back the same time next month with another junk journal for you. Have fun creating everyone…hugs! 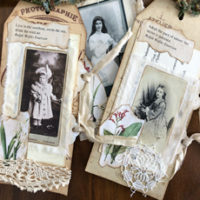 « DIY Faux Rusted French Labels + free printable! I love this project. I’d like to try something like it myself but I have no idea how to go about it. How is the book actually prepared to turn it into a journal. How do you get the original pages out of the book and how do you put the new ones in?